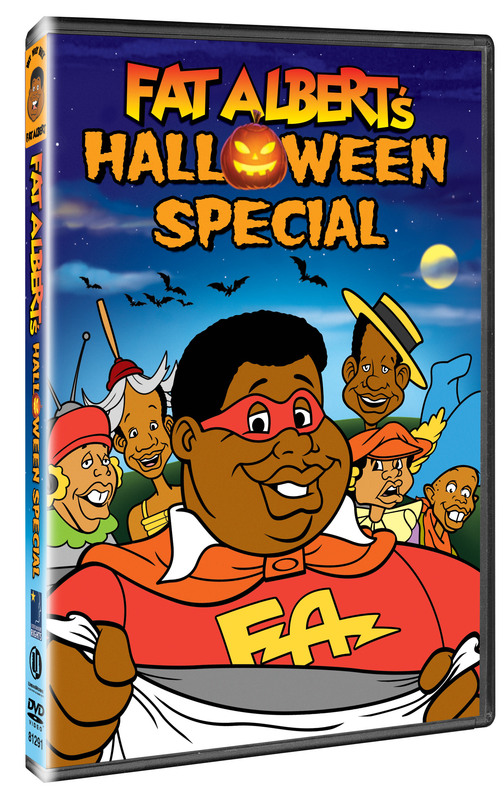 Fat Albert—the 70s Saturday morning sensation—is back, just in time for Halloween. A combination of live-action and animation, the classic “Fat Albert and the Cosby Kids” series is both comedic and educational and stars Bill Cosby in an Emmy® Award-winning performance as the series’ live host, as well as the voice for many of its lovable characters. Featuring music by Oscar®-winning composer Herbie Hancock, the popular series received two Emmy Award nominations and most recently, Fat Albert ranked 12 on TV Guide’s list of the 50 Greatest Cartoon Characters of All Time. Synopsis – After a night filled with more tricking than treating, Rudy and his friend, Devery, plan one last prank for spooky Mrs. Bakewell. But when two of the kids disappear into the old widow’s house, Fat Albert and the crew set out to find their missing friends. Will Halloween fun turn into a fright for the Cosby Kids? Screenvision has partnered with KOCH Vision to present the national premiere of the heartwarming family drama, “Ballet Shoes.” The film, based on the classic novel by Noel Streatfeild, stars Harry Potter’s Emma Watson and features an inspiring story that will make audiences believe “dreams really do come true.” Limited Engagements begin August 26, Visit http://www.balletshoesmovie.com/ for theaters and showtimes. “We three Fossils vow to put our name in the history books, because it is ours, and ours alone…” With these words, three orphans, raised as sisters, embark on an exhilarating journey that takes them to the heights of the stage, screen and sky. Pauline (Watson), Petrova (Yasmin Paige) and Posy Fossil (Lucy Boynton) are adopted as infants by eccentric explorer Professor Matthew Brown (Richard Griffiths), whom they affectionately call Great Uncle Matthew (or “Gum” for short). When “Gum” goes missing, his niece Sylvia (Emilia Fox) keeps the family together by taking in lodgers and eventually enrolls the girls in the Children’s Academy of Dancing and Stage Training. This suits the ambitious Pauline, who longs to act, and Posy, a natural dancer, but Petrova, who yearns to become an aviator, has her own dreams of soaring the skies. The girls’ lives in show business are filled with triumphs and lessons learned until “Gum’s” surprise return provides the perfect happy ending for them all. Continuously in print since first being published in 1936, Streatfeild’s novel, subtitled “A Story of Three Children on the Stage,” has delighted generations of young girls with its message that dreams really do come true. Directed by Sandra Goldbacher (Me Without You, The Governess), the Ballet Shoes feature-length adaptation was produced by Granada for the BBC. North American home video rights were acquired by KOCH Vision from Granada International. KIDS FIRST! / Coalition for Quality Children’s Media are proud to partner with KOCH Vision in support of Ballet Shoes. Look for the “Approved by Kids First!” logo on-screen before theatrical presentations of Ballet Shoes and on the Ballet Shoes movie poster, now on display in theater lobbies across America! Watch charismatic and precocious Bornean orangutans get a second chance to live in the wild on “Orangutan Island” Season 1. Following the dramatic and engaging format of Animal Planet’s top-rated Meerkat Manor, “Orangutan Island,” takes an up-close and personal look at rescued orangutans. Orphaned and homeless, these red-haired “children of the forest” were brought to the Nyaru Menteng Orangutan Rescue and Rehabilitation Center where they were enrolled in Forest School 103. After learning important survival skills to prepare them for life in the wild, 35 of the primate graduates were released on a protected island in Kalimantan, Indonesia and challenged to form their own society and learn how to live free. Lone Droscher-Nielsen is co-founder of the Nyaru Menteng Orangutan Reintroduction Project, and together with her team has created the largest primate rescue project in the world. Follow the precious primates – from feisty Daisy, the four mischievous trouble makers known as the “The Bandit Boys,” femme fatale Jasmine and moody Chen Chen, to name a few – who, unlike mostly solitary wild orangutans, are trying to live together in a community. Fascinating, entertaining and educational, “Orangutan Island” Season 1 DVD includes 13 episodes. A desperate struggle for survival is raging deep in the heart of Borneo’s forests. Illegal logging is rapidly destroying the Bornean orangutans’ last stronghold in the wild — leaving hundreds of orangutan babies orphaned and homeless. Meet the 35 classmates of Forest School 103 at the Nyaru Menteng Orangutan Rescue and Rehabilitation Center. These precocious red-haired “children of the forest” will get the opportunity to live wild on a protected island. Watch their journey to adulthood as they struggle to form their own society and learn how to live free on Orangutan Island. 5th Annual Big Apple Film Festival, Tribeca Cinemas, NYC, November 19-22. Named one of MovieMaker Magazine’s “25 Festivals Worth the Entry Fee”. Submission deadline: September 1st (postmark). Features special NYC premieres, panel discussions and networking events, nightly parties, closing night awards ceremony. To submit go to http://www.bigapplefilmfestival.com/. Video Prospector launches revolutionary new “Try Before You Buy” online tool that allows website designers and owners to place Online Video Actors and Web Video Spokespersons of their choice directly onto their own websites. This unique tool is free to use as often as needed, allowing web designers and website owners to view and assess every Video Actor in the portfolio. tool is as simple as typing in your website name, clicking on the name of the Actor you want to preview, then moving the Actor wherever you want them. .
Media Pros Plus, Inc., an Orlando-based Internet Marketing company selling products and services under the Video Prospector brand name, announced its new “Try Before You Buy” online tool designed to assist potential clients who may be considering placing a Video Web Actor or Video Spokesperson on their own websites. By providing the URL of the client’s website and selecting any of the Actors Video Prospector currently has in its online portfolio, the selected Actor will immediately appear on the client’s website, giving the client a much better idea of how any specific Actor would look as his or her Video Spokesperson. In addition, by doing a “click and drag,” the Actor in the video can be moved anywhere on the client’s website to determine the optimum placement. Access this feature at http://www.videoprospector.com/vp/actors.htm. Online Video Actors or Web Video Spokespersons, as they are sometimes called, are increasingly being used by all types of businesses worldwide. By providing a “human” element in welcoming visitors to their website, visitors can receive a quick summary of what the website has to offer without making the visitor wade through a lot of text. The Spokesperson can appear on the website in a variety of manners, such as fading in and then fading out, but the most popular method has been to have the Actor walk onto the website from the side of the computer screen when a new visitor arrives. The Actor then presents a 30 to 60 second script (jointly developed by the website owner and Video Prospector’s marketing department) before walking back off the side of the screen. The Actor can play a variety of roles. For instance, the Actor can speak as the website owner (such as acting out the role of a business owner, lawyer, real estate agent, etc.) and summarizing his or her credentials. Another effective strategy has been for the Actor to identify with and build a relationship with the visitor by indicating that they, too, had a need for a specific product or service and that the website they are on solved and met that need. Video Prospector has a large portfolio of professional Actors, both male and female, whose acting backgrounds allow them to convey the look, emotion, and body language the website owner wants portrayed. The website owner has full control over how the Actor represents his or her company, from the clothes the Actor wears to the tone of the voice. Video Prospector currently has Actors that speak American English, UK English, Russian and several idioms of Spanish. Actors speaking other languages can be contracted upon request. Website owners can utilize Actors on their websites from anywhere in the world as there are no international restrictions and no local hosting requirements. Video Prospector has developed a variety of services and products that generate leads; direct new prospects to a client’s website; use professional Actors to educate, entertain, and keep prospects on the website longer; then immediately contacts every prospect that indicates an interest through our unique Instant Contact system that calls prospects while they are still on the website! If the visitor call volume grows to a point that a website owner chooses not to handle the calls themselves, Video Prospector’s 24/7 multi-language call center is staffed with trained agents who can ask “qualifying” questions for the owner. The owner instantly receives a recording by email as soon as the call ends, allowing the owner to listen and determine which visitors are “hot” prospects requiring a speedy follow up. By using Video Prospector products and services, our client’s website visitors receive immediate attention and live assistance exactly when they are thinking about buying, while website owners get to pick out the real buyers to contact immediately, without the need to call every person who requests information. An outline of which Video Prospector products are best for certain types of businesses can be found at http://www.videoprospector.com/cgi/d.cgi/vp/forum.htm. Fly Me To the Moon – Great Family Film – Watch for It!. Fly Me To the Moon, from Summit Entertainment is the first 3D animated feature film. One wonders what took so long; it is such a natural for a kids’ movie, which is exactly what this is. And, I have to say – it’s fabulous. I enjoyed watching this film this weekend with a five and an eight-year-old boy. After the film, we talked a lot about the space program and President John Kennedy. The storyline is based loosely on the Apollo 11 space mission in 1969 which landed a man on the moon. In this story, three teen-age flies (Trevor Gagnon, Philo Daniel Bolden and David Gore) stow away on the spacecraft and we experience the adventure from a fly’s point-of-view. The teens think they’re off on a flight that will end in a few minutes and are surprised to find out they will be in space for a week – a bit long for kids who have never spent a night away from home. Once onboard, they have an awesome time experiencing weightlessness, finding droplets of Tang to gobble up, and even rescue the mission from a possible electrical failure. At one point, mission control discovers the flies in the video feed and insists the astronauts capture them. Once captured, they are placed in a test tube and we see their world from inside the test tube. Thanks to a shaky moon landing, the test tube falls and breaks and they escape just in time for the big event – the moon landing – and Nat is chosen as the one fly to accompany the astronauts’ walk on the moon. As they venture out onto the surface of the moon, we hear those famous words of Neil Armstrong’s, “That’s one small step for man; one giant leap for mankind.” After the movie, I had to tell my young friends what those words meant to the world in 1969. Based on actual transcripts and blueprints from NASA, the historical content alone is reason to take your kids or grandkids to this. The visuals are stunning, from the space craft to the minute detail on the flies’ space suits. Even the choice of music during the flight is reminiscent of the era – Richard Strauss’s Also sprach Zarathustra, the theme song from the film 2001: A Space Odyssey (1968). Some of the visuals are just precious such as when the flies get accidentally trapped in the astronaut’s lunchbox and we see the world from the point-of-view of a fly inside a lunchbox. Later, once in space, the flies get captured and are placed in a test tube and again, we see their world from inside the test tube. The film’s theme song is Frank Sinatra’s “Fly Me to The Moon,” which is so appropriate both to the time frame of the film and the subject. The animated fly extended family is simply adorable and who would have thought you’d find a fly cute. From the three teen explores, to the parents, to Grandpa (Christopher Lloyd), and of course, the larvae – the facial expressions are outstanding. Each character is unique in both look and dialogue. History is interwoven throughout, not just the NASA scenes but also as Grandpa’s retells his tale about flying with Amelia Earhart. There are definitely some gross scenes such as Grandpa flying up Emilia’s nose only to be sneezed out along with a large bugger. Yuck. Nadia is drawn in a rather suggestive manner, emphasizing her large bosom and waspish waist. There are some word choices that some won’t appreciate when the Mom says “Lord of the Flies” more than once and there are the fight scenes with the spy flies at the end, but overall – this is a great to film for families. I highly recommend it for ages 5 – 12 as well as baby-boomers. Posted in Uncategorized | Comments Off on Fly Me To the Moon – Great Family Film – Watch for It!. Sweet and spunky Strawberry Shortcake will be rockin’ into American households just in time for back-to-school when Strawberry Shortcake: Rockaberry Roll jams to DVD August 12th . Joined by two of her “berry” best friends Angel Cake and Ginger Snap, the trio bands together to sing up-lifting, catchy tunes the whole family can sing and dance along to. Strawberry and friends continue to rock-out in an encore “Strawberry Jam,” a music video featured on the bonus materials. Additional bonus materials include a character gallery memory book and printable coloring pages. Synopsis – There’s music in the air – and lots of fun, too – for Strawberry Shortcake and all her friends! Strawberry and her pals form their own band, Strawberry Jam, and enter the Strawberryland Talent Show. But when they start playing, no one listens to each other, and they don’t make the cut. When the band gets a second chance to audition, the girls discover that, with a little teamwork, they can make beautiful music together. Later, Peppermint Fizz wants to join the group, but her trumpet only hits sour notes. Strawberry shows Peppermint that if you keep on practicing, those sour notes can turn berry sweet! DVD Features: Sountrack is in English and Spanish Stereo and presented in full screen 1.33:1 aspect ratio with English and Spanish subtitles. The DVD also includes a music video special feature, a character gallery memory book and printable coloring pages. You are currently browsing the Granny Ranny's Coming Attractions weblog archives for August, 2008.